The *Lantern Festival is a Chinese festival celebrated on the fifteenth day of the first month in the *lunar calendar marking the last day of the lunar New Year celebration. In ancient times, the lanterns were fairly simple, and only the *emperor and *noblemen had large *ornate ones. In modern times, lanterns have *been embellished with many complex designs. For example, lanterns are now often made *in the shape of animals. One legend tells us that it was a time to *worship Taiyi, the God of Heaven in ancient times. The belief was that the God of Heaven controlled the *destiny of the human world. He had sixteen dragons *at his disposal and he decided when to *inflict *drought, *storms, *famine or *pestilence upon human beings. Beginning with Qin Shi Huang, the first emperor of China, all the emperors ordered *splendid *ceremonies each year. The emperor would ask Taiyi to bring *favorable weather and good health to him and his people .Wudi of the Han *Dynasty directed special attention to this event. In 104 BCE, he *proclaimed it to be one of the most important celebrations and the ceremony would last throughout the night. Today, the *displaying of lanterns is still a *major event on Lantern Festival. 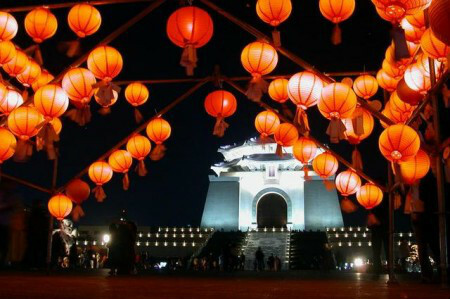 Chengdu in southwest China's Sichuan Province, for example, holds a lantern fair each year in Culture Park. During the Lantern Festival, the park is a *virtual ocean of lanterns. Many new designs *attract large numbers of visitors. The most *eye-catching lantern is the *Dragon Pole. This is a lantern in the shape of a golden dragon, *spiraling up a 38-meter-high pole.